Most often, you will just put your Samsung Galaxy Tab to sleep. Or it will go to sleep on its own, because you didn’t pay enough attention to it. But occasionally, you will want to completely power down your Samsung Galaxy Tab. Press and hold the Power Lock button. 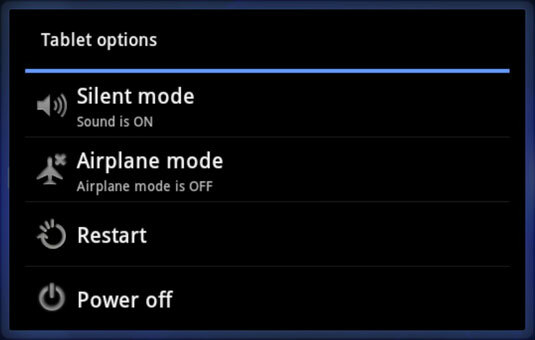 If you chicken out and don’t want to turn off the Tab, touch the Back icon button to dismiss the Tablet Options menu. The Samsung Galaxy Tab turns itself off. The Tab doesn’t run when it’s off, so it doesn’t remind you of appointments, collect e-mail, or let you hear any of the alarms you have set. The Tab also isn’t angry with you for turning it off, though you may sense some resentment when you turn it on again. Be sure to keep the Galaxy Tab in a safe place while it’s turned off.